In April 1862, a nine-year-old boy woke up near Pittsburg Landing on the Tennessee River in the camp of the 22nd Michigan voluntary infantry of the Union Army. It was very early, and the salted pork he pulled from his nearly empty bag was hard and stale. He heard the sounds of cannon, confused because the enemy was not supposed to be close. He packed his bedroll and wished for a sip of water. Finally, he readied his drum in case his regiment were called to battle. Both of these imaginary stories happened at what is now called Shiloh. For me and Bob, Shiloh is a perfect tourist destination that combines his and my interests: an important Civil War site for him plus a large Indian mound site for me. Our visit in early May confirmed it as a very worthy place to visit. 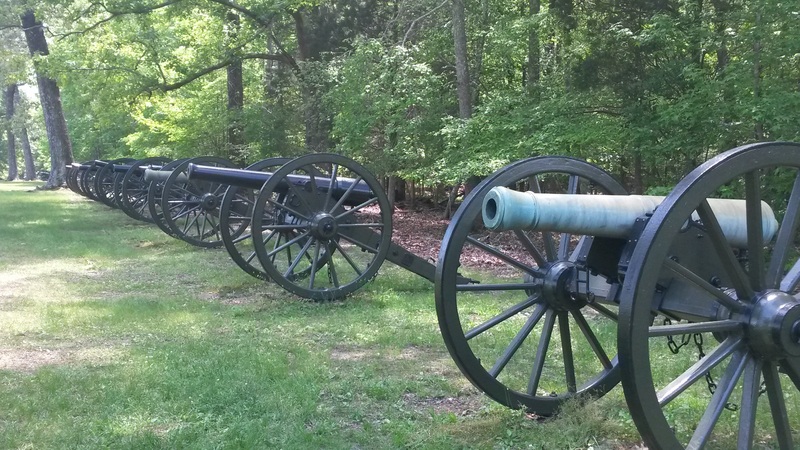 Earlier in our trip, we had stopped at the Parker’s Crossroads battlefield, which was very nicely done as well, but it took us about 40 minutes to see, whereas we spent four hours at Shiloh and could have spent more. Shiloh National Military Park includes a large and beautiful National Cemetery, as well as a 13-mile tour route with hundreds of stone memorials and plentiful signage that takes visitors through the events of the two-day battle. The scenery, even away from the lovely river, is lush and forested, and it was a bonus that the spring flowers were blooming during our visit. 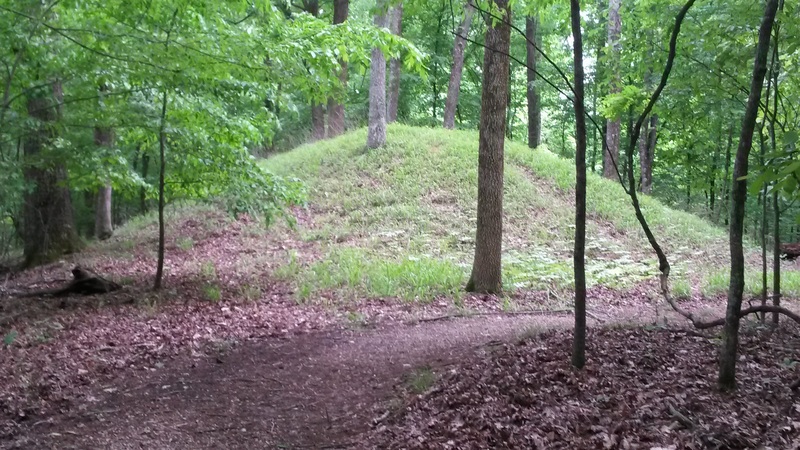 Tucked in one corner of the battlefield is the Shiloh Indian Mounds National Historic Landmark, which contains seven large mounds as well as dozens of house mounds that are still visible because the land was never farmed and these signs of habitation thus were never ploughed down. The artifacts excavated from the Indian village and mounds are not displayed at the site—most are in the museum in Savannah, TN—so only half the story of the large village can be seen at Shiloh. Nonetheless, it is a site well worth the visit, and next time we’ll be sure to make time to go to Savannah. In the meantime, we can imagine that the story of the boy filling baskets of dirt for the mound actually happened, and we can imagine that he grew up to be a star chunkey player, kind of a twelfth-century Peyton Manning. The story of a drummer boy in the Union Army has seeds of truth to it, though the song “The Drummer Boy of Shiloh” was written after young John Clem’s participation in the Battle of Chickamauga. Clem lived to age 85. As we walk the battlefields of our past, now quiet and beautiful, we hope and pray that all boys and girls may live long, happy lives enjoying the gifts of peace and plenty. More photos of Shiloh and of our trip to Tennessee are posted on my Facebook page Out of Work Editor. Next Article Next Article: Take a Cycling Trip—Done!